Oxalate is an organic compound found in certain plant and animal foods. High oxalate levels have been often associated with kidney stones and other health issues. It is hence important to identify such foods and, more importantly, understand if you should limit their intake. 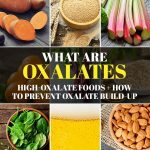 In this article, we will discuss what oxalates are, what foods are high in them, and how to prevent oxalate build-up in your blood. Let’s begin. What Are The Foods High In Oxalates? What Are The Foods Low In Oxalates? What Are The Other Side Effects Of Excess Oxalate Build-Up? Oxalic acid in plants, when bound to minerals, forms oxalate. Your body can also produce oxalate on its own or get it from food. Vitamin C also can get converted into oxalate on getting metabolized (1). When consumed, this oxalate can bind to minerals in the body and form compounds, including calcium oxalate and iron oxalate (2). Though it primarily happens in the colon, this process can also take place in the kidneys or the urinary tract. Most people can excrete these compounds through stool or urine. 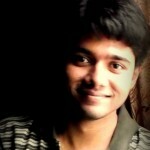 But certain sensitive individuals may develop kidney stones and other health issues upon consuming high-oxalate foods. The first step to avoid such issues is steering clear of foods rich in oxalates. Research tells us to limit our daily oxalate intake to less than 100 mg (or even 50 mg) (4). People with a history of kidney stones or those who have the issue currently must stay away from these foods. Oxalate may bind with calcium in the blood and form calcium oxalate crystals, leading to stones. There are different types of kidney stones, but calcium oxalate is the most common of them. These stones are not formed by calcium through food. In fact, excess calcium that isn’t used by your bones and muscles goes to your kidneys and is flushed out through urine. But when this doesn’t happen, the extra calcium stays in the kidneys and forms stones (5). But there is good news. You can prevent this. Here’s how! A few simple diet and lifestyle changes can help in cutting down the risk of formation of oxalate stones in your body. Cut down on high-oxalate foods. We have already discussed this. Reduce your intake of foods high in oxalates. You don’t have to stop consuming these foods (unless your doctor advises otherwise) because most of them are quite healthy and replete with nutrients and antioxidants. Increase your calcium intake. This may sound contrary to the obvious logic. But yes, low calcium levels in your body can actually increase the risk of oxalate stones. This is because calcium binds with oxalate in the intestines. A high-calcium diet can reduce the amount of oxalate being absorbed in the body. This reduces the risk of stones (6). Drink enough fluids. This is a no-brainer. You must drink at least 4 to 5 liters of water every day – in addition to other fluids. Drinking enough water helps flush out calcium (and other minerals that may possibly form stones) and helps prevent the formation of oxalate stones (7). Avoid excess vitamin C. Oxalate is an end product of vitamin C metabolism. Excessively high doses of vitamin C can lead to the formation of oxalate stones (8). Stick to less than 500 mg of vitamin C daily – especially if you take supplements. Avoid excess protein. Consume optimal amounts of protein. Don’t go overboard. Excess protein intake has also been linked to oxalate stones (9). Cut down on sodium. This includes processed foods like hot dogs, sausages, burgers, canned products, pickles, and other convenience mixes. A high-sodium diet can trigger kidney stones as it increases the amount of calcium in your urine (10). In addition to these measures, you can also include low-oxalate foods in your diet. Including these foods in your diet can help. 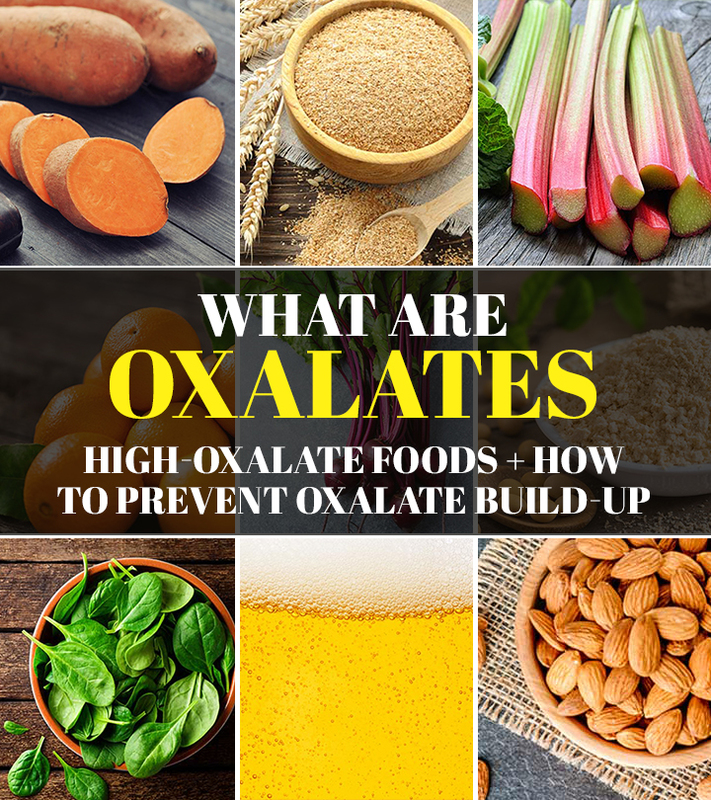 There are other reasons you must prevent oxalate build-up in your body. We will look at them now. Oxalates can also hinder nutrient absorption. We already saw the case with calcium. Oxalates can hinder calcium absorption and lead to other complications, apart from increasing the risk of stone formation (11). Consuming fiber along with oxalates can hinder the absorption of other nutrients like zinc and magnesium (12). Oxalates may also contribute to vulvodynia, a condition characterized by unexplained chronic vaginal pain (13). The role of oxalates instigating this specific condition is doubtful, though. Most foods containing oxalates are actually healthy. You would not want to miss out on their nutrients. Check with your doctor and eat certain high-oxalate foods (like spinach) in moderation. More importantly, increase your fluid intake. Taking these measures can help in preventing the development of oxalate stones. Anything you think we have missed in this post? Do tell us by leaving a comment in the box below. “Effect of ascorbic acid consumption…” The Journal of Urology, US National Library of Medicine. “Oxalate content of foods and its…” Asia Pacific Journal of Clinical Nutrition. “Foods high in oxalate” Michigan Medicine, University of Michigan. “How to eat a low oxalate diet” The University of Chicago. “What are kidney stones?” National Institute of Diabetes and Digestive and Kidney Diseases. “Preventing kidney stones” National Center for Biotechnology Information. “How do health care professionals treat…” National Institute of Diabetes and Digestive and Kidney Diseases. “Ascorbate increases human…” The Journal of Nutrition, US National Library of Medicine. “High protein diet brings risk of…” British Medical Journal, US National Library of Medicine. “5 steps for preventing kidney stones” Harvard Medical School. “Oxalate: effect on calcium…” The American Journal of Clinical Nutrition, US National Library of Medicine. “Mineral balances of human subjects consuming…” The American Journal of Clinical Nutrition, US National Library of Medicine. “Urinary oxalate excretion and…” American Journal of Obstetrics and Gynecology, US National Library of Medicine. Osteopenia Diet – What Is It And What Foods To Avoid?